Hillary Clinton told Greenpeace she was going to reject fossil fuel donations yet her campaign has received over US$4.5 million from the industry. The Greenpeace USA activist who rattled Democratic party presidential candidate, Hillary Clinton, at a New York rally said the former secretary of state didn’t sign the group’s #FixDemocracy campaign but pledged to reject future fossil fuel contributions, in a statement released on Thursday. 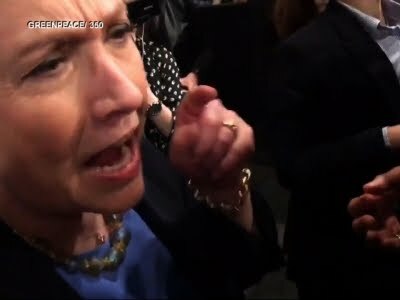 Clinton didn’t sign up for the Greenpeace cause, that asked all presidential candidates to rebuff all donations from the industry, but she responded by saying she will reject fossil fuel donations given to her campaign although she has been funded by oil and gas firms, according to Eva Resnick-Day who questioned Clinton at a campaign rally. “While we appreciated Hillary’s response, the first step a candidate can take to stop fossil fuels is to stop taking fossil fuel money,” Resnick-Day wrote. “For instance, she supports a Department of Justice investigation of ExxonMobil and yet she takes money from an Exxon lobbyist” she continued. The activist cited data compiled by Greenpeace’s research department that claim Clinton’s campaign and the Super PAC supporting her have “received more than US$4.5 million from the fossil fuel industry during the 2016 election cycle” despite informing the group she wouldn’t be accepting donations from such companies.